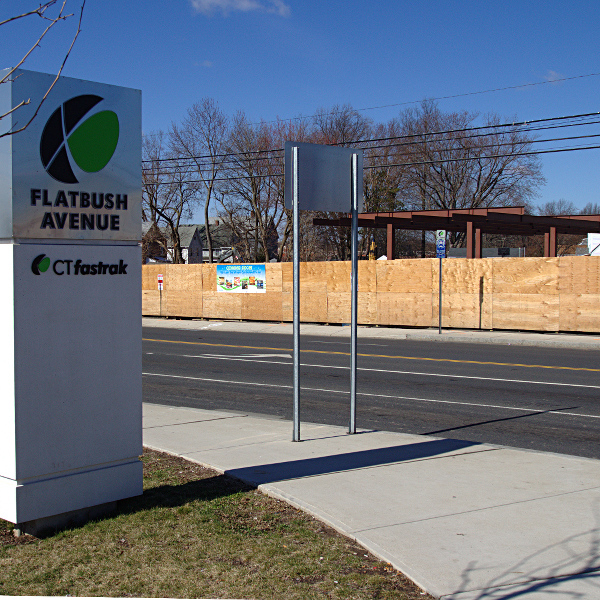 Directly across the street from the Flatbush Avenue Fastrak station is the first new development along the rapid bus transit corridor. The site was assembled by combining three adjacent parcels. It appears that the developer paid over $1 million for the properties in two separate deals in September of 2015. The map below comes from the West Hartford GIS site, with the new development outlined in red and the Fastrak station outlined in green. A plywood construction barrier was installed around the entire perimeter, and the various buildings on the site were torn down. I was excited about the prospect of a new development right across the street from the transit station. It was the first of what will hopefully be many new projects along the bus line. The project has been public for quite some time, so you may already know what they’re building. But for those that don’t. 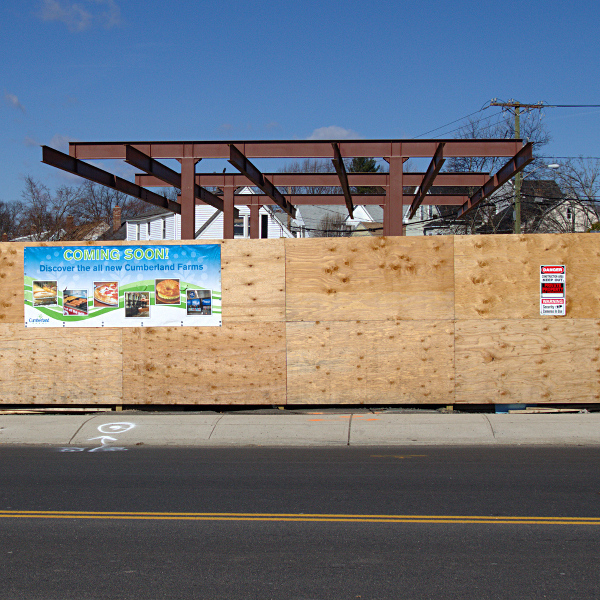 What do you think that steel rising above the plywood construction barrier will eventually be? What is the big investment being made across the street from public transportation? It’s a gas station! Cue the sad trombone. I’m no Transit Oriented Development expert, but my understanding is that a gas station is an auto-centric land use, which is generally discouraged for TOD sites. Worst of all, this will be the second gas station on the intersection. There is no doubt that this will be a beautiful gas station. It will be spacious, and brand new, but putting a gas station next to the transit station is a failure – a lost opportunity. That lot could have been used for something far more complementary to the busway. It is interesting to read Ronni Newton’s account of the Annual Economic Development Update given by West Hartford Director of Community Services Mark McGovern on March 24, 2016. Ms. Newton captured scores of specific projects and businesses mentioned during the talk, and included paragraphs about Transit Oriented Development and the New Park Avenue Corridor. However, there was apparently no mention of this gas station. 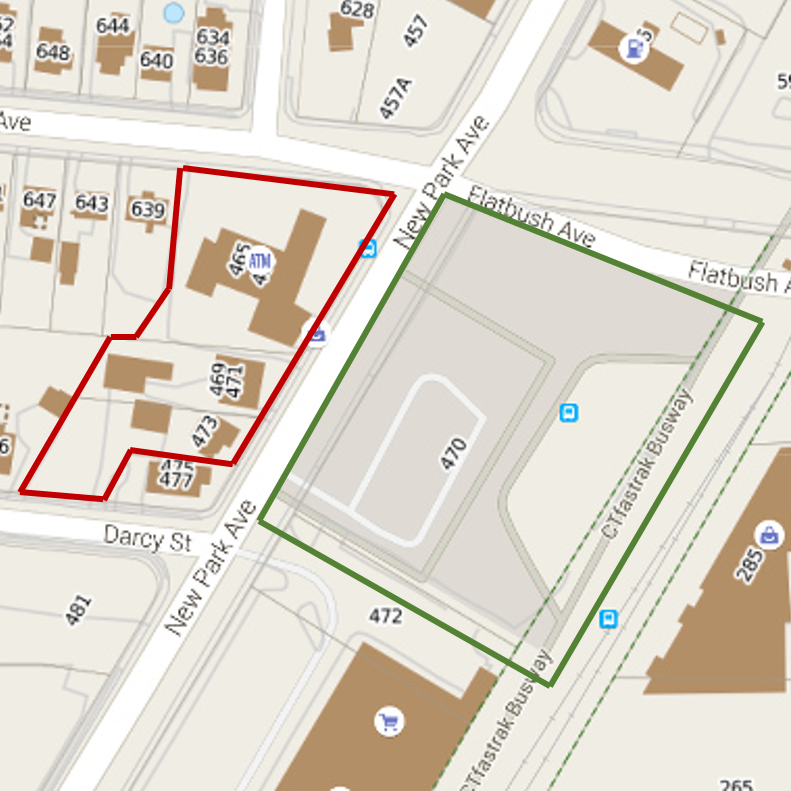 Perhaps further development, real transit oriented development, could save the Flatbush Station. The Town is optimistic that a station for the New Haven – Hartford commuter rail will be located at that site. Maybe the connection to both the busway (access to Hartford and New Britain and all the spurs), plus the train access (New Haven and even New York City) will encourage a most substantial development. Imagine a building that straddles the transit corridor. The ground level would be the transit stations. Above the stations would be a couple levels of parking. Above that would be multiple residential towers. By bridging the busway and railroad tracks, the building could also provide a much better pedestian connection between New Park Avenue and the WalMart plaza on the other side. Now that would be transit oriented development.